English translation of the 2018 annual report for the Sounds of Palestine music project for children in Palestine. Translation of a website for a private school including comprehensive pedagogical philosophy and a full description of the school and kindergarten. Translation of information material as well as internal documents. 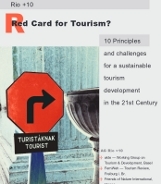 Translation of a brochure on sustainable tourism: 10 principles and challenges for a sustainable tourism development in the 21st century.